MOSCOW, Idaho – Dave and Julie Cowan’s oldest son was born two months before his due date, on March 5, 1990. On the second day of Bobby’s two-month stay in a neonatal intensive unit at a Los Angeles hospital, the Cowans put an Idaho Vandals hat in his incubator. It didn’t leave Bobby’s side until he left the hospital. Four-and-half years later, the Cowans had a second son, Trent, and he too was surrounded by silver and gold. And not just as a newborn. His grandparents were such generous University of Idaho boosters that the school’s basketball venue, Cowan Spectrum, is named after them. His father and mother (and their siblings) were UI graduates and diehard Vandals. His brother eventually left for Moscow and became an All-American punter at Idaho. Trent Cowan grew up wanting the same thing that Bobby experienced – to play for the team he had loved all his life. He also dreamed of facing Boise State at Broncos Stadium after traveling to the Idaho-BSU game every year with his family. He fulfilled his first dream when he signed with the Vandals out of high school in 2013. On Thursday, the senior tight end gets to fulfill his second dream – sort of – when Idaho and Colorado State meet in the Famous Idaho Potato Bowl in Boise (4 p.m., ESPN). Cowan is an easy player for Vandals fans to cheer for. He doesn’t mind taking a shot at BSU and its field. He was raised in all-Vandal family in Camas, Washington. His support for Idaho football never wavered despite watching mostly bad teams as a kid. And he’s developed into one of the bedrock players for a program that went from 1-11 and 1-10 his first two years to 8-4 this season. Cowan cares so deeply about the University of Idaho that he wrote a letter to school president Chuck Staben last spring outlining 12 reasons why the football program should remain in the FBS. The Sun Belt had just dismissed UI (effective after the 2017 season) and Cowan says he thought emailing Staben was the right way to express his thoughts. Dave Cowan, at the behest of his father, Bob, resent Trent’s letter to Staben after the Vandals completed their winningest season since ’98. Staben hasn’t budged from his stance, saying it’s the right move with no FBS conference interested in Idaho. But because of it, Bob and his wife Jan have decided to pull their annual $100,000 donation to the university, and Dave and Julie have stopped giving too. In the letter, Trent cited the loss of revenue and scholarships that would result from going to the Big Sky. He wrote that the FCS is a “watered-down division” after the departure of so many schools to the FBS. He added that the television audience for Idaho’s last bowl appearance, the 2009 Humanitarian Bowl (now the Potato Bowl), was almost twice as high as the FCS championship game that year. The honorable mention Sun Belt tight end says its bittersweet to think after next year the Vandals won’t have a chance to go to another bowl game. For the Cowan family, the Potato Bowl will be bittersweet for another reason. It will be the 99th straight (and last) game that Bobby or Trent have appeared in an Idaho uniform. After redshirting in 2008, Bobby was the team’s punter from 2009-2012. Trent joined the program the following year when Bobby was a volunteer assistant while trying out for NFL teams. Dave and Julie have attended 97 of the 99 games, only missing a pair of Bobby’s games when Trent’s Union High School teams were in the state playoffs and the boys’ schedules overlapped. “It’s been a great journey,” says Dave, who owns a machinery company in the Portland area. Bob Cowan, Trent’s grandfather, is a former president at Lamb Weston, a major potato products company. Dave says his dad is the inventor of the curly fry, a subject that’s been debated enough that Bob wrote a book about it. Bob and Jan met while attending Idaho in the 1950s. Dave followed suit, meeting Julie when the two were in school at UI. 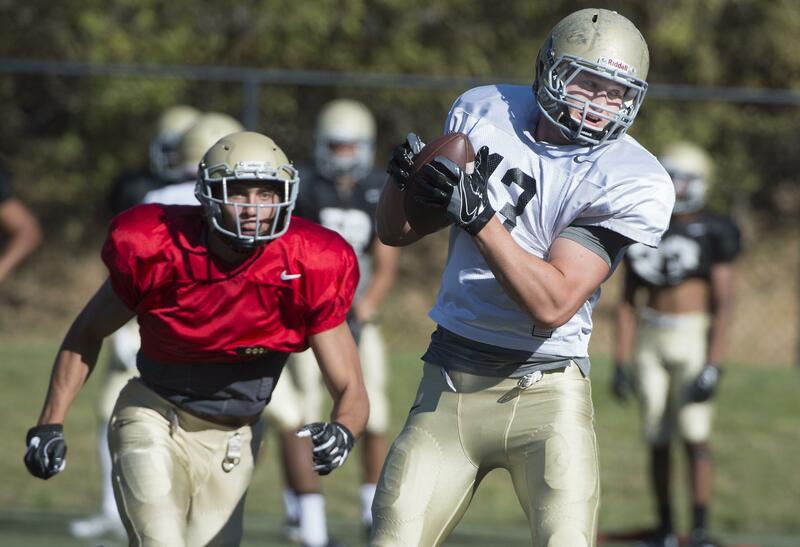 By the time Trent settled in at Idaho, he was a 6-foot-3, 205-pound receiver. He played around 20 snaps a game as a true freshman, showing good blocking skills and serving as the team’s holder. After his second year, he moved to tight end – a decision he and Petrino made together. He immediately started bulking up and is now a sculpted 230 pounds. Trent originally added 20 pounds, then tacked on another 5. It was all lean mass, strength and conditioning coach Jake Scharnhorst says. Since the position switch, Trent has caught 94 passes, 10 for touchdowns, the last two seasons. He’s the Vandals’ most reliable target on third down and in the red zone. “He’s definitely a guy you want to go to when it’s crunch time,” Petrino says. That he’s doing all this as a lifelong Vandal only makes it more special – for him, his family and Idaho fans. Published: Dec. 18, 2016, 9:16 p.m.